I bet you know the answer to this question. If you ever ask yourself a question “Wow, these drones are expensive, are they worth the money?” go back to the beginning of the article and read the opening question again. You should always consider the ROI (return of investment) in equipment that you’re buying for your photography, not just the equipment prices. A lot of realtors who aren’t using drones already said that they are planning to use them in the future, because today, this is A Must! There are many different drones on the market today with different sizes, designs, qualities and prices. Let me be honest – you get what you pay for, but be sure that it will certainly help you sell. Drones are changing the face of real estate and it’s never been more fun. In this article I’ll show you 5 best drones for real estate photography. 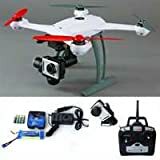 My personal recommendation is option #1 but if you want to get a cheaper drone I suggest to take a look at the drone bestsellers in the end of the article. Since you don’t have to take your clients house hunting and you can show them their potential homes through virtual tours with an aerial presentation, you have to have high quality videos that can be provided only by good drones. This is the new “must have” in real estate so there is a huge competition in the market. Therefore, you really have to know what you are looking for when you are deciding which drone to buy. 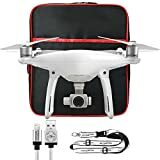 The latest drone DJI released is Phantom 4 and it’s not cheap but it is one of the smartest on the market. This drone might be the one that anyone could fly and it’s certainly worth the money. This is the first model you can buy with advanced obstacle-avoidance system, and sure you can see that when you fly it directly at any object it will stop itself, but when something comes from the side it doesn’t recognize it, and you still need a phone or a tablet ready to go along with the controller. The system can potentially keep you out of trouble, but that is not excuse to fly carelessly, so you should learn how to pilot a drone properly. With new features this model needed a new design too. With aerodynamic body and gimbal design, a more of it was places inside the body. It also has more powerful motors and propellers than its predecessors. Quadcopter features a 3-axis stabilized integrated camera with 2.7K video and 12MP stills. Fly the drone up to 25 minutes with the included intelligent battery. 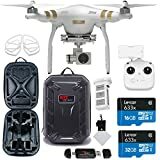 A range of accessories is included: 1 battery and charger, 2 full sets of propellers, radio controller, 8GB micro SD card; comes with extra battery. This is ready – to – fly quadcopter with built – in camera, and it’s very stable because of the three – axis gimbal. The DJI Phantom 3 Standard is a great drone with intelligent Flight Modes, found on the company’s higher-end models. 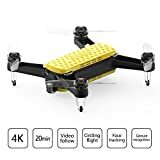 For its price this might be the best drone for real estate if you are a beginner, especially because it’s really simple to operate. This drone’s camera can snap 12MP photos in both Adobe DNG Raw and JPEG formats. With GO app you can change the shutter speed and ISO and exposure compensation, and you can also set it on burst shooting, exposure bracketing and time-lapse photography. The Phantom 3 Standard has white design with metallic red details, which made Phantom series recognizable. The Phantom 3 Professional 4K records sharp, stable 4k footage includes automated flight and safety features. Actually, it’s the exact same drone as Phantom 3 Standard with one key difference and that is video resolution. This drone as the same design as every drone in Phantom family – it’s white with gold accents. 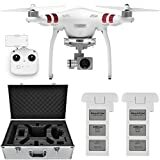 The P3 Professional is the least expensive solution if you are looking for high resolution real estate recordings, which are delivered to this drone by 4K format. The Q500 itself is a big aircraft. The remote control is also big and it incorporates an Android tablet into its design. This drone has very wide lens but it doesn’t show the fish eye distortion. When the camera is set on Auto Mode, white balance is impermanent, but it has manual white balance option. This camera sets itself apart from the crowd with slow motion video and superior construction. With this drone you can chose between manual flight, autoleveling and Smart Mode which enables your GPS and compass mode. You can use compass mode when you are not sure where your drone is and, obviously, by pushing the stick forward you will make the drone more away from you, but by pulling it towards you, the drone will come towards you. the 350 QX2 is easier to use even than a Phantom. If you ever plan to work on real estate photography, getting a drone is a must. Remember the example from the beginning of the article? Don’t be a photographer from image 1 and get yourself a professional drone and remember to always consider the ROI of a drone for real estate photography. You could get your money back in just few gigs (depending on your location and prices there). What do you think? Let me know in the comments and I’ll reply asap. Thanks for reading.